Page last edited 2014-10-14 09:15:21 (version 11). 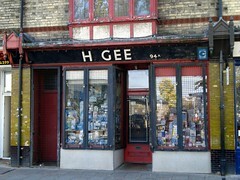 Gee's is a traditional electronics shop of the sort that used to be common 30 or 40 years ago and has now largely disappeared. It will sell you individual electronic components, in paper bags, retrieved from the stacks of small wooden draws behind the counter. It has been there for many decades (and doesn't seem to have changed much in that time), and it's quite possible some of the stock has as well, so you may well find they still have stock of some no longer manufactured component. However, although they don't have a large stock of the latest stuff, they sometimes have some surprisingly niche items, usually where someone only wanted one or two and Gee's had to buy in a pack of 5 or 10 and kept the remainder. As well as components they also sell a range of electronic and electrical items, tools and accessories. Anything from Individual Torches, Batteries, Rechargeables/Chargers, Bulbs/Tubes/Power Saver Minitubes/LED lamps, Lampholders, Plugs, Sockets, Connectors, Junction Boxes, Resistors, Rheostats, Capacitors, Relays, Valves, Diodes, LEDs, Transistors, Voltage Regulators, Integrated Circuits, Circuit Boards, Meters, LED Displays, Test Meters, Magnets, Motors, Buzzers, Calculators, Clocks, Gadgets, Lamps, Aerials, Screwdrivers, Sockets, Hacksaws, Drills, Craft knives/Blades/Grinding Wheels/Stones, etc... You Just Have To See The Shop to Believe the Selections ! Even the Window Displays are Packed with Gadgets and Amazing ! Last edited 2014-10-14 09:15:21 (version 11; diff). List all versions.